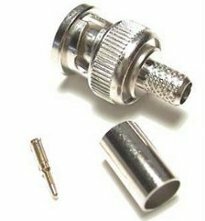 BNC Connectors are RF connectors that interconnect two coaxial cables or connect a cable with CCTV components, namely DVRs and cameras. There are several types of BNC connectors. The primary types are screw on, crimp on or compression type connectors. The most commonly used in CCTV applications is the crimp on type. Different types of coax cable can also require a different size of BNC connector. They are also used in Ethernet networks, video connections, network cards, and cable interconnections.